HEPA Rated when used with 3M™ Random Orbital Sanders with Self-Generated Vacuum to collect sanding dust. 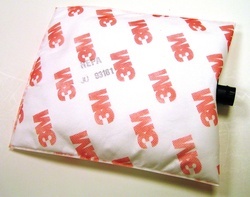 Use with 3M™ Clean Sanding Filter Bag Backpack/Hip Pack Assembly which holds and protects the Filter Bag. Extra large size provides more dust collection capacity, which reduces the time required for operators to change bags.